I don't know why but my beauty wish list of late consists solely of palettes. Im not usually a palette lover, as I'm guaranteed to dislike a few shades and I actually find them less than convenient to travel with, preferring to take a bagful of single shadows on my travels. Im pretty low maintenance like that. Lols! Recently, however, I have held touched swatched and lusted over four particular palettes and I don't think il rest until they are firmly in my make up collection. I wait forever for a palette full of colours il actually use to come out, only for four to come along at once. Make up palettes seem to be a lot like buses. Just a little more glamorous. Here are my chosen four. Im aware they all look painfully similar, but bare with me because I need them in my life - and I think you will need them too! Top Left - Laura Mercier Bluch & Glow Radiant Face Trio - £45 How beautiful is this! Three of my favourite products by Laura Mercier, all housed in a tortoise shell style compact. The matte radiance baked powder's are one of my favourite highlights, and you also get 'Ritual' - a baked blush bronze. I can't think of a better way to warm up my skin this winter. Top Right - Becca Champagne Glow Palette - $34 Im sure this isn't the first time somebody has blogged about this palette. Becca pressed highlights are just beyond beautiful, and I currently own use and love the shade Opal. This trio also includes the infamous Champagne pop (swooooooon) and an interesting looking copper shade that I think would also work well as a shadow. I think the price is pretty incredible, as each shade usually costs $38 and although these are smaller, its honestly impossible to get through a full one so this should last a while. The only downside is that this palette is currently sold out, but I'm stalking most sephora stores to track one down. Bottom Left - Make Up Forever Artist Palette Volume 1/ Nudes you need - $42.00 I swatched this in store and OMG I can't tell you how amazing this is. The colours, oh the colours. Nudes, shimmers, coppers, golds, bronzes, and an incredible black for lining. This is a bit of me, in a palette. Make up forever shadows have the most incredible consistency and pigmentation, and this is certainly no exception. Bottom Right - Smashbox ShapeMatters Palette $55 - Im already a fan of smashbox contour sticks, but I'm yet to try their powder equivalent. This palette is essentially three in one, you get the full sized contour powders for face, two brow powders and a wax, and 9 eyeshadows for shading the eyes. You also get the advice on how to contour your individual face shape. Out of the four this is certainly a palette il be snapping up very soon, as I think its something il be able to use everyday and that = good beauty maths! 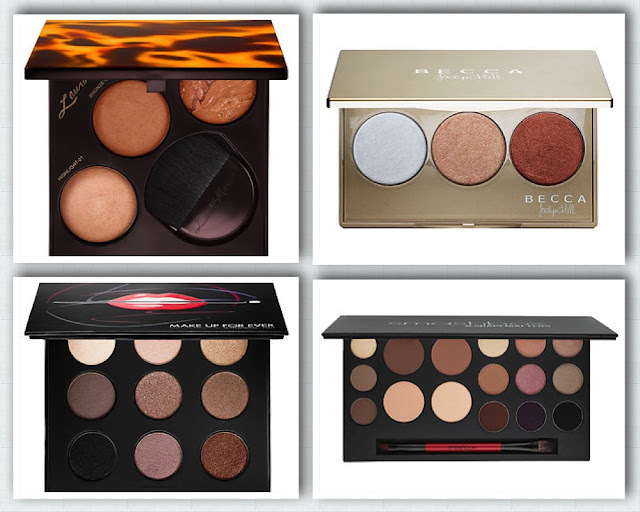 Have you tried any of these palettes? Whats the verdict people?! All these palettes look gorgeous but for some reason the Make Up Forever Artist Palette Volume 1/ Nudes you need catches my eye the most! so pretty! I would love to try the Smashbox palette. It seems to be perfect.